Patrick Lichfield. ‘He’s a cousin of the Queen, you know!’ I wonder how often that was said in a slightly lowered, confidential way by those who had just heard. 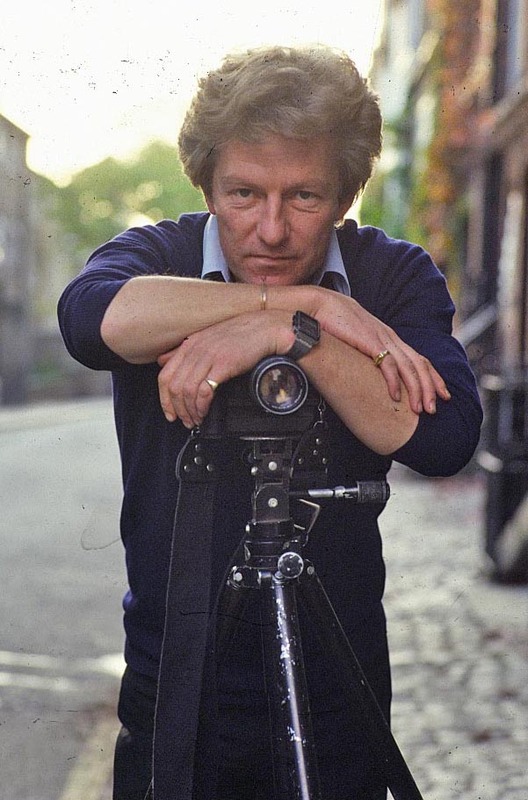 He was born in 1939 and from the 1960s until his tragically sudden death in November 2005 Thomas Patrick John Anson, 5th Earl of Lichfield, was recognised as the photographer of the time. His residence was the former family seat, Shugborough Hall, near Cannock Chase in Staffordshire but he worked from his London studio. He was educated at Harrow and Sandhurst and joined the Grenadier Guards in 1959. He left the Army in 1962 and got himself a job as a photographer’s assistant. By 1981, with his two long-term assistants Peter (Pedro) Kain, who shot the picture above, and John (Snowy) Whyte, and later Fanny Rush, he had shot up to the point when he was commissioned by the Queen to shoot the official portraits of Prince and Princess of Wales in 1981 and of the Queen and Duke of Edinburgh for the Golden Jubilee in 2002. And it was his skill, artistry and sheer good nature that made him the outstanding photographer that everyone discovered him to be. When digital photography began to show itself capable of doing more or less what film was doing, Patrick saw the light and plunged. He became as much a master of pixel as of emulsion and found, in doing so, that he was saving huge sums previously spent on film. When I commissioned him in 1979 to shoot the 1981 Kodak Calendar, the thought of giving him the theme of ‘Harrow’ seemed a sensible one, and so it proved. He jumped into the idea. Harrow was his schooldays home, and the whole scene was obviously remembered in detail as we explored the buildings and the grounds. ‘We must do this one!’ he said as we walked into the ancient room known by every boy and master as ‘the Fourth Form room’. It is maintained exactly as it was when, at the beginning of the school’s life in 1571, its Founder, John Lyon, sat in the old canopied seat as first master. The seat is still in place. 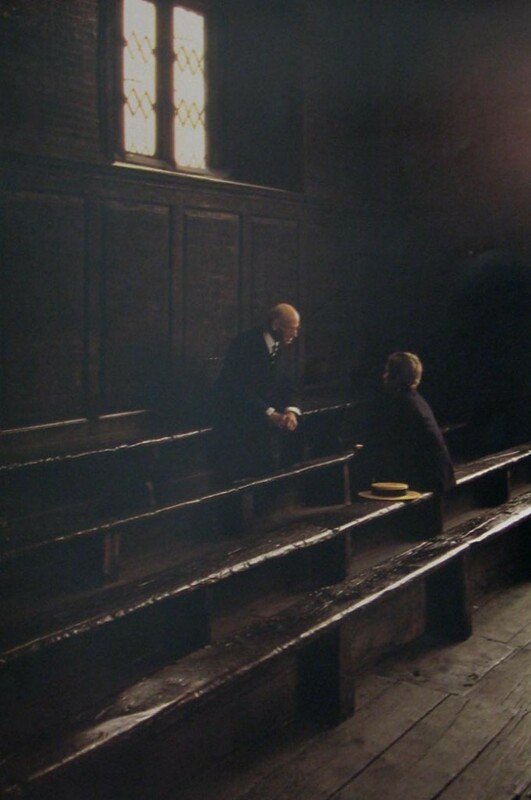 Patrick finally selected one corner of this room, inviting both the (then) oldest living Old Harrovian and the youngest to sit, facing each other, on the uncomfortable forms upon which the first generation of Harrow boys sat. Carved by boys’ own hands on the dingy oak panelling which surrounds the room are the names of Byron, Sir Robert Peel, Sir William Jones, Lord Palmerston, Sheridan, and of many other Harrovians who became famous in after-life. As he showed us ‘Ducker’, the late 1890s outdoor swimming pool with a low wooden bridge crossing it he remembered it with a bit of a shudder. They were taken there in the mornings to strip naked in the sheds and dive in from the bridge, even on very cold mornings. In and around Harrow Hill, too, he worked wonders. The lady (a professional model) measuring up the melons became a happy talking point. In a nearby field he saw the girl riding, and snapped it; the one of the lad fishing was carefully worked out, as was the one from the bottom of the school steps, catching the boy as he swerved round. There was also one of me, in a bowler hat, leaning against the signboard on Harrow-on-the Hill station, but you wouldn’t want to see that. I gave him another commission for a Kodak Calendar; the theme I chose was ‘Trees’ and I used twelve photographers, one for each month. During the early planning I tried to arrange for each to choose the month he or she would prefer and, by and large, all were satisfied. Patrick chose December. In a forthcoming post I’ll tell you about the astonishing effect he achieved. 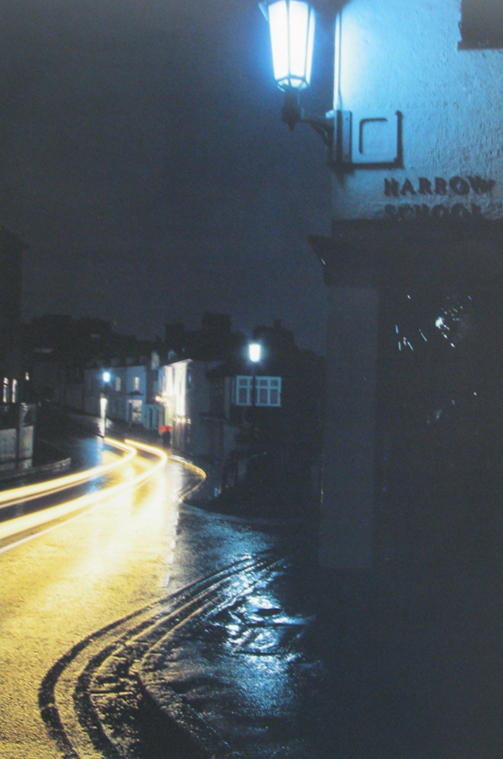 For Harrow, one scene I suggested was a night shot in one of the streets, a wet night provided by the Fire Service with puddles reflecting street lights, window lights and so on. It was fixed. Our teenage daughter would be the sole figure visible in the distance, hurrying towards the camera and carrying a red umbrella. I booked the Fire Service. The day and the evening came. In twilight Patrick found the right viewpoint along the winding, uphill house-lined street to the final sharp bend to the church. As the last glow of dusk turned to darkness he explained to our daughter exactly where she should walk and at what angle to hold the umbrella. One of his assistants picked up bits of noticeable rubbish in gutters while the other knocked on a few doors to ask if they would be kind enough to switch on their front-room lights. What happened next verged on the theatrical. This entry was posted in Autobiographical and tagged 5th earl of lichfield, calendar, cannock chase, fourth form room, golden jubilee, harrow, john (snowy) white, lichfield, pedro kaine, queen, sandhurst on 19/06/2012 by Paul.